Can video cameras be used to encourage health care workers to wash their hands? Yes, according to one study, but only if video-monitoring is combined with continuous feedback to workers. Feedback, that is, as in progress displayed on electronic boards mounted in hospital hallways! Are there other uses for the monitor and feedback approach? Hand-washing is one of the simplest and most important measures we can take to prevent infection, yet it is frequently omitted, even in the health care environment. A report in the journal Clinical Infectious Diseases, however, found hand-washing rates in a hospital intensive care unit (ICU) soared when workers were video-monitored and provided feedback. ICU health care worker hand-washing habits were observed remotely for two years. In the first 16 weeks of the study, employees were video-monitored with their knowledge, but no feedback was offered. During that time hand-washing rates were less than 10 percent. A 91-week period followed during which continuous hand-washing performance feedback was displayed electronically in hallways. 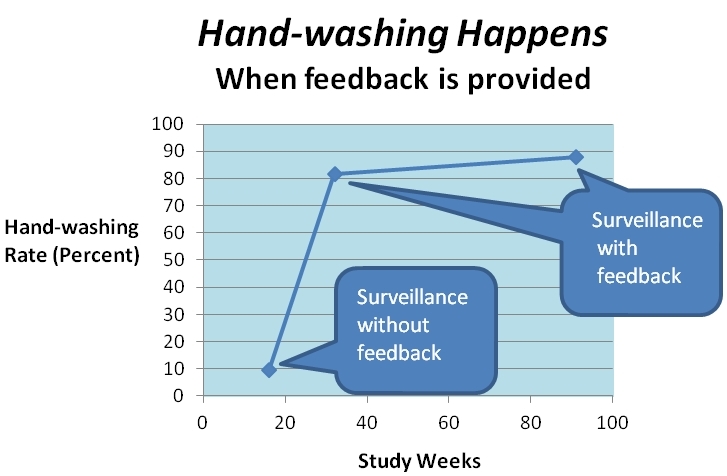 For the first 16 weeks of surveillance with feedback, hand-washing rates rose to nearly 82 percent. In the following 75 weeks, the rate rose to and was sustained at almost 88 percent. The monitor and feedback strategy could be used to increase hand-washing rates among employees, not only in hospitals, but also in nursing homes, day care environments and restaurants. The study raises intriguing possibilities for fostering other hygienic behaviors as well. It is a promising strategy with far-reaching potential for public health benefits!